In our guide to Heatline boilers, we’re going to cover prices, their combi boiler range, and ultimately, whether you should buy one, or head for a competitor. Heatline are part of Vaillant Group. As many of you know, Vaillant products compete with top name brands such as Worcester, Baxi and Potterton. Typically, Vaillant offer products in the premium end of the market, with a long warranty. Like Worcester, Baxi and Potterton, you’ll easily be able to find merchants stocking Vaillant, and installers that fit them. Heatline, however, are the budget arm of Vaillant. And generally, they’re not as popular with merchants or installers; finding somewhere to make a purchase or a local installer to fit one, might be a bit harder than you think. Being the budget arm of Vaillant Group, the prices on offer are much lower than those in the Vaillant range, but so are the warranties. So, being a budget boiler, the real question is, how much do they actually cost? Typically, you’d expect to pay around £1,400 for a 24kw Heatline boiler installation, and around £1,500-1,600 for a 28kw. Compared to an equivalent Worcester combi boiler , you’d be looking at saving around £400-500. But you need to factor in the fact that the drop in warranty is from 10-years (Worcester Bosch), to 2-years (Heatline). If you want to compare prices for Worcester and Heatline, you can do that here. The Heatline boiler range isn’t complicated, mainly due to the fact they focus on one model, the Heatline Capriz. You’ll be able to get the Heatline Capriz 24kw for smaller properties, and the Capriz 28kw for larger properties. Each comes with a 24 hour anologue timer, are A-rated and run at 89.3% efficiency. 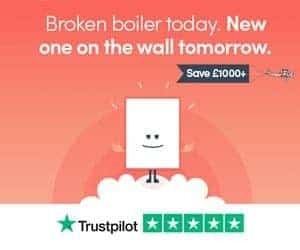 So, if you’ve got an old boiler that’s a low ERP rating (C or lower, for instance), you’ll be making instant savings on your energy bills with a new boiler installation. So, do you need a 24kw or 28kw Capriz? Hot water output of 24kw. Hot water output of 28kw. You can see the difference in prices between the two here. The Capriz 24kw and 28kw boilers are a basic budget boiler. The main reason you’d be choosing this over ones available from our list of the best boiler manufacturers, is the reduction in price. Frost protection, to protect the boiler from freezing during winter. The Capriz only comes with a 2-year parts and labour warranty. And in our opinion, that’s just not enough. If a brand has the confidence in their product to offer a long warranty, most likely, that’s exactly what they’ll do. So, short warranties don’t give us a much confidence that our investment is going to be cost effective (or protected), long-term. Even if in general, the Heatline Capriz is reliable, you still run the risk that if anything goes wrong after 2-years, you’ll be footing the bill for the repair costs. Worst case scenario, you’ll be paying for a completely new installation. With an expected installation cost of around £1,400 for a 24kw combi boiler, and in excess of £1,500 for the 28kw combi, you’re going to want more protection than a 2-years. Typically, we’d aim for a minimum of 5-years warranty, which can be found from plenty of manufacturers. For instance, you’ll get 7-years as standard on the Ideal Logic Plus (as high 12-years with the Ideal Max), and up to 10-years on a range of Worcester Bosch boilers here. Should You Buy A Heatline Boiler? Personally, I’d not buy a boiler with a 2-year warranty. That’s nothing against Heatline, or any other brand offering 2-year warranties. In fact, Ideal Boilers (who we’re a fan of) offer the Ideal Logic (not the Plus model) which comes with a 2-year warranty…and I wouldn’t buy that either! A lot of the overall installation cost is made up of labour and parts other than the boiler (filter, copper pipe etc). So, if you’re making a reasonable investment, whether it’s £1400 or £1900, you want to be protected for at least 5-years (*opinion). If possible, stretching to 7-10 years via long standard warranties or extended warranties is certainly preferred – you can get that from installers like BOXT, here. And, it’s not like there aren’t boiler manufacturers offering these warranties on boilers that are reasonably priced. The likes of Viessmann, Ideal and Worcester are all listed in our guide to the best boilers available, and all offer long warranties. Thanks for reading our guide to Heatline boilers. Still not sure about which brands or installers to use for your new boiler? Check out our guide to boiler installation here. Got questions? Drop us a line via our contact form, and we’ll get back to you as soon as possible.